Richie Stine one of our long time Customers has purchased our Stage 5 Powerglide with the optional 1:58 Planetary Gear Set, 10 Clutch Drum and Steel Pump. It is also available with our Variable Stall Control. Call now for our Fall Specials. Vinnie has one of our very first 4STB, it was build in 1997 and still running strong!! 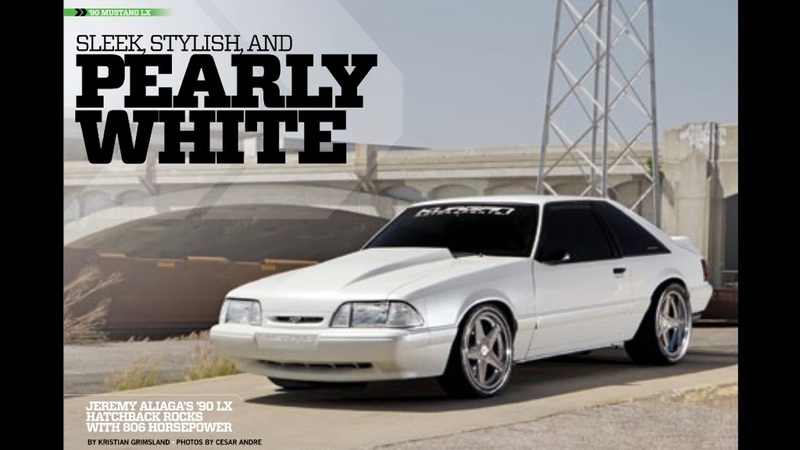 Congratulations to Randy Seward of Orlando, FL for getting his 91 Mustang to the Ultimate level of being a TRUE Street/Strip machine. In February, after driving 160 miles to the NMRA event in Bradenton, FL his record setting (3) pass average was 8.66 et at 158mph! To top it off, a month later he drove 500 miles to the NMRA event in Atlanta, and once again turned in some very nice 8.70ss. Amazingly he not only raced with the same tires he drove on, but he managed to get nearly 20mpg using our high performance 4STB (AOD) Overdrive transmission. I don't remember exactly what it was that triggered it, but I suddenly decided I was going to build another Mustang. So I started hunting the local ads and ebay for a coupe. I eventually ended up buying a 4-cylinder Calypso green coupe with a body in decent shape for $1800 from someone on ebay. It was located a few hundred miles away in the Florida panhandle new Pensacola so my girlfriend and I took a weekend vacation, drove there to pick up the car. The car arrived at my house in April of 2007 and the project was on. Since I was going to make some serious power and wanted something that could take the abuse, I decided to build the motor from scratch using aftermarket components. Fortunately, one of my long time friends is Ronnie Crawford in Miami, Fl. He has been building engines for 40 years and was the one who designed the first 347 stroker engine. First, he had me call Dale at Pro-Power in Ft. Lauderdale. Dale provides just about any 5.0 engine parts you might need to build some real power. He also will spec a custom camshaft for you. In my case I have decided to stay with a hydraulic stick for drivability and ease of maintenance. 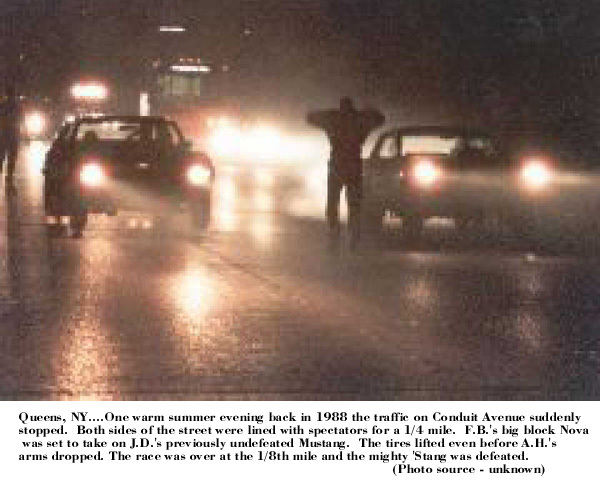 My original plan for the car was to make it a 9 second street-strip car that could be driven on a regular basis. I still don't own a trailer so the car had to make it everywhere on its own. I was originally going to reuse the C-4 from my previous car but while researching components to rebuild it, I happened upon FB Transmissions web site. They had a higher torque/horsepower rating for their AOD (4STB) with the electric overdrive than their C-4. I called and talked to Mike and Fred Brown and they assured me that the transmission would take everything I was planning for. Though it was heavier than the C-4, I decided to go with the durability of the higher rated transmission and the overdrive for drivability for trips on the highway. For almost three years the transmission has performed virtually flawless and has been tested far past the original power levels I expected to throw at it. It seems to be good for around 200 passes between rebuilds. The 10" PTC torque convertor has had no problems either. The transmission came with a trans-brake and has also been upgraded by FB Transmission with a 2.84 low gear and their patented Variable Stall Control (VSC) system. When hooked up to the trans-brake button, the VSC temporarily limits the fluid flow to the convertor allowing it to stall much higher. Once the trans-brake button is released, the fluid flow returns to normal and the convertor rrecovers and tightens back up to its normal setting. The low gear and VSC helps the car leave hard. Leaving at 3400 lbs with 3lbs of boost the car has managed a 1.28 short time and there's still a lot left. But I will have to continue to test the car to see how far it will go in this department. The car has been tuned gradually to the current performance level. I was never in a hurry to make a killer pass. 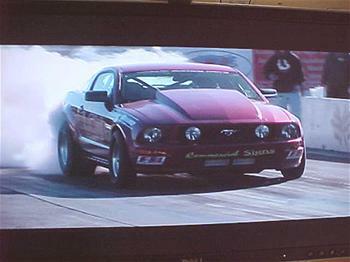 Every trip to the drag strip was primarily a chance to test the car at a particular power level and the car has steadily gotten faster during this process. The car has approximately 500 passes on it to date. Everyone asks how much power it makes and I really can only estimate that at the current tune it is running at, it has 1200 flywheel and 1000 rwhp. All of the tuning has been done at the drag strip. I have not been concerned with putting it on a chassis Dyno to measure the power. I am more concerned with how to make power, not how much power the car has. Car drives very much like most Fox body Mustangs. It idles smoothly, and with the overdrive and 3.25 gear, it gets almost 20 mph on the highway. The only detractions compared to most Mustangs of this style are the manual steering and brakes. With a spool, it takes some effort to maneuver the car at very slow speeds such as parking. But who's driving slow? I would really like to thank Jay at Real Street, Mike and Fred Brown at FB Performance Transmissions, Ronnie Crawford, Mike and Todd Braasch at TRZ for all their help and support. My future plans for the car are to continue to engineer things and make some minor changes to make it faster. How fast is a secret right now, but I intend to keep it on the street and driving to the race track. 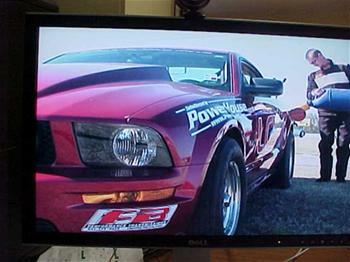 Steven and Lance were featured on a local network TV show about drag racing Cajun style. The documentary was following the progress of their car as they tried to get it into the mid 9 sec range for the 1/4 mile. DRAG VIDEO.....4STB-E TRANS IN ACTION !!! Click the link below and check out NY's own James Lasurdo in a time run with his 03' Mustang Mach 1 featuring an FB Performance 4STB-E. 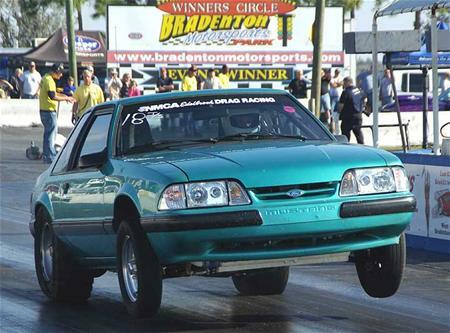 If you can't view the link check out the video in our Racer Gallery by clicking on James Lasurdos' Mustang image.